Bit of an old article but interesting nonetheless. DNA Divulges Dodo’s Ancestry: Scientific American. And I have dubbed this week a bird week for the blog! 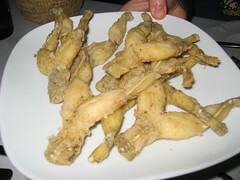 Here’s an interesting article from Scientific American: Extinction Countdown: How Eating Frog Legs Is Causing Frog Extinctions. It mentions a fungus, that has had a hand in frog extinctions.